I just happened to catch former MLB pitcher and current MLB.com analyst Mitch Williams calling into the morning show on 106.7 this am. And I felt compelled to immediately call into the show to rebut some of the more arguable statements he made. Of course, this being Washington DC they only took 2 calls (one of which immediately changed the subject to golf; nice screening there WJFK) before moving onto a football-related segment, so I’ll exhaust my need to speak up in this space. Williams had lots to say about Stephen Strasburg‘s mechanics, Mike Rizzo‘s decision to shut him down, and other fun stuff. First off, I find it ironic that a guy with some of the worst mechanics in the last 25 years has the audacity to question Strasburg’s mechanics. Williams nearly dislocated his left shoulder on every delivery and fell off to the 3rd base side so badly that he nearly hit the ground on each pitch (as is displayed in the photo above). Strasburg, on the other hand, was considered to have impeccable mechanics upon hitting the draft and you really had to squint to find flaws in his delivery. Google searches on the topic are so muddied with opinions that its hard to find actual scouting reports from his amateur days versus “hindsight is 20/20” pieces that look for flaws to explain his 2010 injury. But its ironic that Strasburg suddenly has all these mechanical issues according to pundits, because he got injured. 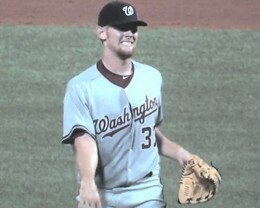 Speaking of that 2010 injury, Williams intimated that the infamous “Inverted W” was the reason Strasburg got hurt. I just have an awful hard time with that theory. First, its a THEORY and is merely a coincidental piece of evidence in pitcher injuries. 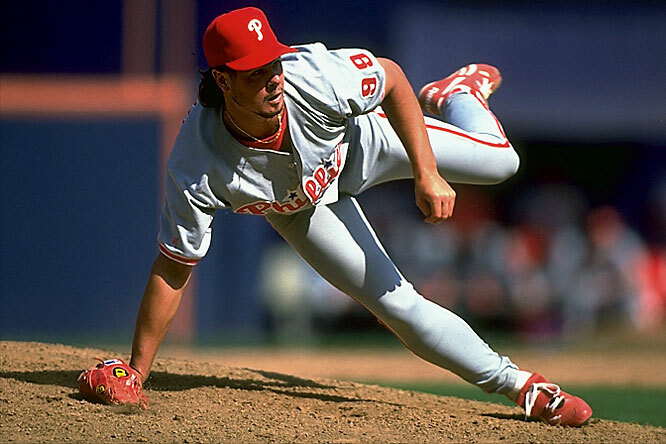 You can find examples of pitchers who get into this position pre-delivery who have never had any injury issues just as easily as you can cherry-pick guys like Strasburg or Mark Prior who have suffered injuries. More importantly, the Inverted W is more indicative of SHOULDER injuries in pitchers, not elbow ligament tears. Shoulder injuries in pitchers are by and large wear-and-tear injuries, caused by over use and over-throwing over hundreds and thousands of pitches. You don’t generally throw one pitch and tear completely through your labrum or rotator cuff. However, elbow injuries to the UCL are almost entirely singular, acute injuries caused on a specific pitch. We all can remember the exact pitch Strasburg threw to injure his arm and the grimace on his face after he threw it (as well as the blowhard Rob Dibble comments …. but we’ll choose to ignore those). I wrote at the time my opinion on why Strasburg got hurt, and it had nothing to do with his pitching mechanics (my pet theory: Ivan Rodriguez fell in love with Strasburg’s change-up, had him throwing too many of them, and the vastly increased stress on his elbow caused the injury. See the Aug 2010 post linked above for more detail). I think its irresponsible for Williams to get onto a local radio show and opine that Strasburg “needs to change his mechanics” because of the injury, or else he’ll always be an injury concern. Because in reality, nobody knows. Personally I think teams trying to “change mechanics” in pitchers is a mistake; you throw one way your entire life, from age 5-6 onwards, and your entire shoulder/arm combination becomes inured to that method of throwing. How can anyone think that suddenly as a 25 yr old you can even change the fundamental way you throw a baseball and be successful? Adjustments, no problem. Fix slight timing issues or slight changes to your wind up? Sure. Core changes to arm slots and arm loading? Problematic. Williams continued with the same tired themes we’ve been hearing from National writers (i.e., the Veterans aren’t going to like this, its a team game, the Nats should have managed this better, the Nats are foolish not to go for it, etc). But he fails to mention what most fail to mention; Rizzo arrived at this shutdown decision with Strasburg the SAME way he did with Jordan Zimmermann last year; he talked with the surgeon who performed the surgery (Dr. Lewis Yocum in LA, the same doctor apparently about to pronounce the same fate on our 2012 #1 draft pick Lucas Giolito) and arrived at a prescribed, pre-defined innings limit. You notice we’re in the EXACT same position as we were with Zimmermann in 2011, yet without any of the national media interest. (And so far, that limit has worked out pretty darn well for the Nats and Zimmermann; right now, he’s 2nd best in the NL in several macro pitching categories; bWAR, ERA and ERA+, while being top 10 in WHIP, K/BB, and BB/9). The way I look at it is thus: if you or I had Heart Surgery, your Cardiologist probably would recommend a course of recovery. For the first X months, avoid any activity, then ease your way back to vigorous activity over a period of Y more months. And you’d follow that advice, right? Well, the pitching arm of a Major League Starter pretty much is equivalent to the heart of a normal person; without that arm, you’re not a major leaguer any more. So when you get surgery on it, you listen to your doctor and do exactly what he says. 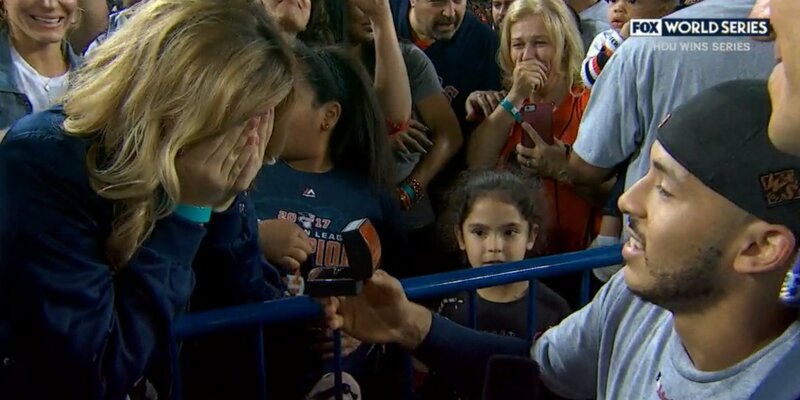 If someone told that same heart patient that, well because we’re really close to the World Series, you should really ignore your surgeon and just go for it for the betterment of the team, what would you say? You’d probably say, “well, this may help the team make this one short term goal but I may be dead a lot sooner because of it.” In my mind, that’s what Strasburg/Rizzo are doing; they’re following the same advice that has now led to Zimmermann having a fantastic (and healthy) 2012 season. There are no absolutes in life; Strasburg could absolutely re-injure himself in 2 years time and turn into this generation’s Mark Prior. Or he could be like Chris Carpenter, who had the TJ surgery in 2007 then recovered to a 17-4 record in 2009 as a guy in his mid 30s. But anyone who thinks they know otherwise is just stating an opinion. And everyone has an opinion. I support the shutdown, I think its prudent for the longer term position of this team, and I don’t think 2012 is a once-in-a-lifetime shot for this franchise. Of the “core 15” of the Nats (8 positional players, 5 starters and 2 relievers) exactly ONE guy is a free agent or not presented with at least an option for 2013. Most of these guys are either signed long term or under team control for at least another FOUR seasons. So this team isn’t going anywhere. You play it safe and get ready for a 4-5 year run. Where would 2011 WS Game 6 rank all time? (This post was inspired by the very last question in David Shoenfeld‘s 12/20/11 chat, asking where this game ranks among the greatest ever games played). For those of you with the MLB network (channel 213 on DirecTV), the series they featured this year profiling the “Greatest 20 games of the last half century” was my favorite bit of sports programming since the 30-for-30 series on ESPN debuted. Bob Costas and Tom Verducci hosted and did 1-2 hour reviews of these 20 games and brought in guest hosts for each game in the form of actual players and managers who participated in the games themselves. These guest hosts provided fantastic commentary on the state of the dugouts at each critical juncture as well as first hand knowledge of their own thought processes throughout. If you haven’t seen the series, I highly suggest setting your DVR and watching them. 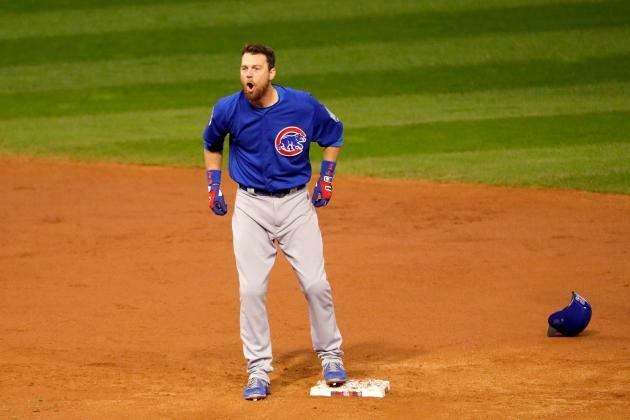 Now the interesting question: where would Game 6 of our most recent World Series have ranked, if it were a candidate to be included? For me, game 6 was absolutely the most entertaining game I’ve ever witnessed, in person or on TV. It wasn’t the best played game (with errors and questionable manager decisions and no less than three blown saves) but it was amazingly entertaining, suspenseful, and with a story-book ending that was almost out of a movie script. But does it rank with the best game list that MLB network came up with? (A quick glance at the top 20 list above has one glaring game that I’d honestly replace immediately; the Bartman game was more iconic for the individual play and not for the game itself, which ended up being a blowout when all was said and done. Nearly every other game on this list featured late game comebacks and walk-off hits). Pittsburgh jumps to a 4-0 lead early. Yogi Berra and Mickey Mantle help spark a 4-run rally in the 6th to take a 5-4 lead. The Yankees extend their lead to 7-5 in the top of the 8th. The Pirates rally for FIVE runs in the bottom of the 8th for a 9-7 lead. The Yankees’ two hall of famers Berra and Mantle manage to drive in the tying runs in the top of the 9th to make it 9-9. Mazeroski blasts a walk-off homer on a 1-0 count to lead off the bottom of the 9th and win the world series. Where to put 2011’s game 6? I think I’d place it right around the #4 spot. 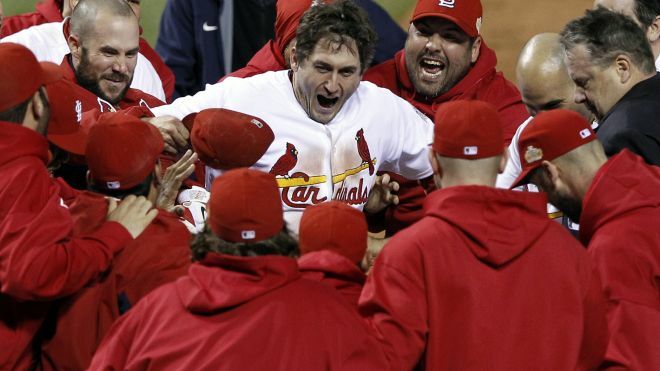 David Freese‘s heroics will soon settle into place as one of the legendary performances in post season history. I can’t dislodge the current top 3 games on MLB’s list. Its a common folly for the immediate labeling of recent events as “the best ever” without standing the test of time, but in this case I feel comfortable in the statement that this game is one for the ages, absolutely. Tom Boswell must have been on vacation; he hasn’t done a chat in weeks. Well, he caught up and more on August 15th’s version. Here’s how i’d have answered the questions he took. As always, the “questions” posed are edited here for levity and clarity, and I write my “answer” before reading his. Q: Why is Espinosa struggling at the plate? Q: Will the Nats get to 77 victories? A: With a .479 winning percentage as of 8/15/11, that puts them on a pace for 77 wins (rounding down since they’re one game ahead of their pythagorean won-loss record). I would say that the team will likely fail to reach that threshold though; September is going to see debut starts given to guys who have never seen the majors, and the transition is usually pretty tough. I see a few extra losses thrown in there to bring down our win totals to the 73-74 range. Boswell sticks by his pre-season prediction of 75. Its looking like a good prediction. Q: How has Davey Johnson performed so far? A: I’d say he’s been awful. Even given that Riggleman’s record was improved by a winning streak, the numbers are clear. Riggleman was .500 with this team, Johnson is 17-24 (as of 8/15/11). I think he’s poorly managed the bullpen and is poorly handling his starters. On more than one occasion he’s let a starting pitcher make the 3rd out in the 6th, only to yank him one walk or one hit into the 7th. This makes no sense to me! Why give away that at-bat and that out (remember; you only get 27 outs in a game) especially if there’s runners on base and you still have hitters off the bench. What was the point of “strengthening the bench” if you never use those hitters? Grr. Boswell agrees with me somewhat, and notes that Johnson quickly ended the lineup manipulations under Riggleman. I’m not going to kill Riggleman for trying those lineup mods; they did lead to a very hot streak for this team. Another interesting fact; the team has given up 10+ runs 6 times so far under Johnson but only twice before that under Riggleman; why is that? The implication seemed to be that Riggleman was over-using Storen and Clippard. Q: Will Purke sign by the deadline? A: I didn’t think so: I was wrong. Boswell had no answer, just said he’d be watching at midnight on 8/15/11. Q: Should MLB allow close/controversial plays to be replayed on the scoreboard? A: Good question: right now presumably these plays are NOT shown on scoreboards to prevent further fan-distress and histronics from the argumentative players and managers. So, clearly when a play is not shown on the board the tacit message sent to all who are watching is, “oh they’re not showing the play so the umps must have blown it.” It doesn’t seem to really cause that much grief in the NFL, which plays replays instantly (since they have 35 seconds to kill after every play). So I think MLB should just show replays of all plays and not editorialize. Boswell seems to agree. Q: In 2013, what are the chances that this is the lineup we see every day: Ramos, Morse, Rendon, Espinosa, Zimmerman, Harper, CF, Werth? A: Pretty close in my estimation. We don’t have positions listed but the implication is that Harper is playing LF, Morse 1B and Rendon 2nd. 2013 may be a tad too early for Rendon; it may be a safer bet to put Lombardozzi at leadoff/2nd. I think Harper should be trained as a center fielder. Rendon should be able to transition to LF if need be, but it may be a waste of his abilities. Otherwise this looks pretty close. Boswell says there’s a pretty good chance, talks about Rendon a bit then gets more digs into Desmond despite his not being named here. Q: Is there any significant relationship between payroll outlay (Nats 9th from bottom) and w/l record (14th from bottom)? A: (links to use here: list of payroll by team, and the current MLB standings 1-30. Nats are, as of 8/16/11 18th in W/L and22nd in total payroll. There is definitely a relationship in general between payroll and won/loss records; I don’t think its a coincidence that the 3 highest payrolls (NYY, Boston, Philadelphia) are also the 3 best teams. However that middle ground is where the direct correlation breaks down. The Chicago Cubs have the 6th highest payroll and are 27th in won/losses. Meanwhile the Tampa Bay Rays are 29th in payroll but have the 9th best record playing in the AL East. This middle ground is where teams can use superior General Managers, superior scouting and overall organizational improvements to be better than they appear. With respect to the Nationals current positions, I’ll say two things. Yes we’re clearly doing “better” than our payroll would indicate, a sign that Rizzo is getting good value for his contract dollars. Its despicable that a team with owners as wealthy as the Lerners, playing in a $600M stadium that was given to the team, and playing in the wealthiest per-capita area with a top 8 population center in the country isn’t spending more on this team. A: Batting Average needs context, yes. A well-hit line drive directly at a 3rd baseman is really a better hit ball than a weak tweener ground ball that gets through for a hit. If looking at the BA, you really should look at the BABIP (which for Werth is now .281 on the season, decent and closer to league norms than earlier, but still below his career .314) and his breakdowns of line drives, grounders and flyballs. Here we see that Werth’s LD% is about on a par with his season last year, but his fly balls are way down. Makes sense; more of his flyballs were turning into homers at the cozy Philadelphia park. The stat I really use the most is OPS+, which normalizes the OPS (on base percentage plus slugging) to the league averages and is read more or less as a percentage value as compared to MLB average. Werth’s number there is currently 98, meaning his OPS is about 2% worse than the league norm. Now, this isn’t great (he’s being paid like on of the top 10 players in the league and was 5th in the NL in OPS+ last year), but it isn’t Adam Dunn. Boswell points out that Werth’s slugging % is down and that he’ll be here til the next president is in office. Q: Was Strasburg an injury waiting to happen? Q: What is going on with Zimmerman’s throwing motion? A: Looks to me like the team has tried to address his biggest problem; making the un-pressured throw accurately. It happens; you get a ball, have all the time in the world, and fire a ball over your first baseman’s head. Then it gets into your head and you’re in trouble. If this weird motion works (and it certainly seems to) then more power to him. You’ll notice, by the way, that he never makes a throwing error when pressured or on the run. At least not that I can remember. Boswell Agrees. Q: Should/Will the Nats go after Jose Reyes this off season? A: Should they? I don’t think so; depends on if they think Desmond has any future or if they can move over Espinosa and call up Lombardozzi. It’d be foolish to spend $12M/year on a leadoff hitter who is only slightly better than your $440k/year in-house options. Will they? We’ll see. Boswell thinks they shouldn’t and lists a few more good reasons. Q: Would you trade all the National’s young pitchers for the Orioles’? A: No. Way. Baltimore has a habit of destroying young arms lately. And I like the upside of our slew of prospects versus theirs. Boswell says no way. Q: Zimm/Morse/Werth in 2012 vs Zimm/Dunn/Willingham in 2010? A: Offense only? You take the latter. That was three guys with OPS’s in the 140s back to back to back. Werth did it in his contract year but not before or since really. Morse is a breakout guy this year; can he continue? Can Zimmerman stay healthy? Does Verducci’s article about Strasburg’s Mechanics worry you? This is an image I hope we don’t see again. In an article that seemingly came out of nowhere, Si.com columnist Tom Verducci posted this missive on 3/8/11 with ominous warnings to Nationals fans everywhere. He believes that Stephen Strasburg has a fatal flaw in his mechanics related to the timing of his stride forward off the rubber versus his release point that may continue to plague the pitcher even after his post Tommy John surgery recovery. I say this article comes out of nowhere since I would have expected to see this posted back in August 2010, when every other pundit posted their own theories as to why “the best pitching prospect ever” suddenly blew out his elbow. I reviewed some of those explanations at the time but thought (and still do think) that his injury was less about his release point and more about pitch selection. I think that Strasburg (and more importantly his catchers) fell in love with his change-up after discovering what a devastating pitch it was (imagine facing a 91-mph screw ball that moves a foot into the right handed hitter). Suddenly he was throwing a ton of circle changes and placing unexpected, here-to-fore unseen stress directly on his elbow ligament. When a hurler goes from pitching one day a week in a protected environment where he can get by throwing mostly fastballs to overpower college hitters to suddenly throwing only about 58% fastballs (per Verducci’s research) at the Major league level every 5 days, sudden injury onset can occur. Verducci touches on the preponderance of off-speed pitches Strasburg was throwing in the article but focuses on the “late cocking” of the arm as the primary culprit of the injury. He then lists a number of pitchers who exhibit this same late arm cocking with (conveniently) a ghastly list of arm and shoulder injuries that followed. John Smoltz was listed as a pitcher who had this fatal mechanical flaw (he also has inverted W syndrome) and listed as an “example” of what can happen. Yes Smoltz blew out his elbow in his early 30s and missed an entire major league season. But he also pitched until he was 42, made over 700 major league starts, won 213 games and saved another 154 while he was in the closer role theoretically “protecting” his arm. If Strasburg gives the Washington franchise those kinds of numbers between now and the year 2030 (when he too will be 42 years of age) I will never quibble. For me, shoulder injuries are the injuries that you really worry about. Look at Chien-Ming Wang right now; he’s throwing in the low 80s 2+ years on from shoulder surgery. The Nats have taken fliers on several other post-shoulder injury starters over the past few years (Brian Lawrence, Ryan Drese, John Patterson) with limited success. However, pitchers seem to be able to recover from Tommy John surgeries with much better regularity. I realize our own Shawn Hill had the TJ surgery and never really came back, but the list of successful pitchers who have had the TJ surgery is long. 3 of the top 5 NL Cy Young candidates last year (Josh Johnson, Tim Hudson and now Adam Wainwright) have had the TJ surgery, as did 2009 NL cy Young winner Chris Carpenter. Our own Jordan Zimmermann seems to be nicely recovering, although it is far too soon to conclude that his surgery was a success. I sometimes wonder what modern medicine could have done with Sandy Koufax, who abruptly retired at age 30 after a Cy Young winning season where he made 41 starts and went 27-9. His retirement reason was listed as “arthritis in his pitching elbow” and he had symptoms that included massive hemorrhaging in his arm; was this a condition that would be easily solved today? For Strasburg, as with pretty much any baseball pitcher, in many ways every pitch could be your last. Modern medicine can fix all kinds of injuries and modern technology can pin point the wheres and whys of why some guys may last and some guys may be flashes in the pan. But in the end, some guys physiologically are more durable than others, some guys can throw a ball through a brick wall for 25 years (see Ryan, Nolan) and others break down after just a few professional games. Lets just hope for the best once Strasburg comes back. What really “caused” the Strasburg Injury? By now, we’ve all heard the news: Steven Strasburg is headed towards Tommy John surgery and won’t be back for 12-18 months, which probably puts him out for the entirety of the 2011 season. Analysis and observation seem to show that the acute injury was the result of a singular injury, namely his 5th inning change up thrown to Domonic Brown which left him visibly shaking his right arm. 1. Over-protection by the team. I have an awful hard time believing this. Strasburg never went more than 100 pitches or 7 innings in any major or minor league start this season. Does that mean he was more susceptible to a major arm injury? I seriously doubt it. There are those pundits who blame the Nats for NOT gaining an MRI of his shoulder during his 15-day DL stint, which is similarly ridiculous. He had a shoulder injury not an elbow injury. If he had blown out a groin would those same pundits be saying the team should have MRI’d his legs too? 2. A mechanical change: Some analysis that i’ve read (this post by Foxsport’s Jon Paul Morosi) has quotes from unnamed scouts that say his mechanics had changed slightly, which (Morosi intimated) may have resulted in stress on the elbow that had not been there before. To test this, compare his Pitch F/X report from his MLB debut on June 8th to that fateful day in Philadelphia last week. Comparing the release points in these two plots shows something interesting; his release point is indeed several inches higher on average in his last game versus his first. Comparing The 6/8 video versus the 8/21 video isn’t really helpful; the former just shows every strikeout while the latter replays the fateful pitch where the injury occurred. One would have to see the isolated feeds side by side to really see a difference. However, a slight mechanical change could certainly be factor. 3. The “Inverted W” Effect: There some pundits out there on the net who believe that the “Inverted W” effect (where a pitcher’s pre-release arm positions resembles an upside-down W) indicates a proclivity of arm injuries. The name most often associated with this (the poster boy, so to speak), is Mark Prior, who had supposedly clean mechanics, threw hard and was basically out of baseball by the time he was 25. Writer Chris O’Leary has several examples plus an entire section on Strasburg, who does exhibit the behavior. The problem I have with the inverted W theory is that you can cherry pick from the thousands of major league pitchers out there to prove or disprove this theory. O’Leary himself uses John Smoltz as an example of someone who had the Inverted W, saying that Smoltz “… retired due to shoulder problems.” Uh, Smoltz made over 700 HUNDRED starts, plus had 4 years as a closer, and made 32 starts the year he turned 40. Thats about as BAD of an example as you can find to prove your theory. Yes Strasburg exhibits the inverted W behavior, but not nearly as definitively as poster boys such as Prior or Reyes. 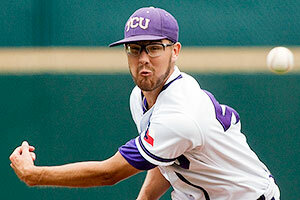 But he’s never had shoulder problems, and damage to the elbow seems to be indicative of something besides the W effect. 4. 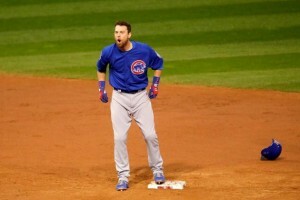 Scapular Loading: some googling about his injury turned up this interesing article at Drivelinebaseball.com. In essence, Strasburg puts undue stress on his elbow based on “scapular loading” during his windup. The article concludes that this behavior possibly contributed but isn’t necessarily the cause. It is worth a read though. I don’t know nearly enough about the subject to agree or disagree to heavily. 5. Strasburg was throwing FAR more change-ups than he’s used to. In college, he was so dominant that he could be a 2-pitch pitcher (4-seamer and curve) and pitch his way to the player of the year award. However, in the pros 3 pitches are required and 4 good pitches are desired. Luckily, Strasburg possessed a 91-mph circle change that moved 10-12 inches on the horizontal plane, an absolutely ridiculous pitch. Well, his catchers noticed this too, knowing that a screw-ball like 91 mph pitch had a better chance of getting hit by lightening than being hit hard, and started calling for it more and more. For the season he threw that pitch 16.7% of the time (according to Fangraphs.com) but by the time the fateful Philadelphia game rolled around he was throwing it more like 20-21% of the time. The circle change is a rather difficult pitch to master. You essentially make a “circle” with your thumb and forefinger around the ball, then throw the ball with a fastball arm-action but letting it “tumble” off your remaining three fingers. This causes the screw-ball like reverse movement on the ball when thrown with enough velocity. It is a great pitch; not only does it come out of the hand slower (hence the changeup) but it moves unlike any of your other pitches. The bad part of the pitch; it causes a ton of stress on the arm. Your wrist and fingers are very strong and contribute to the natural fastball motion; by taking them out of play with the circle-change you use a lot more of your forearm and elbow to “throw” the pitch. Conclusions: in the end, it is difficult to know exactly what happened. I personally believe the over-reliance on the circle change was his downfall, but the other points (mechanical changes, inverted-W tendencies and scapular loading) are difficult to discount. In any case, Tommy John surgery is so common now amongst power pitchers that you start to hear rumblings about pitchers getting it done as a preventative measure (!!). Jonah Keri had a great q&a session with the originator of the procedure and it makes for a great read. So we’ll cross our fingers, hope that around this time next august Strasburg is pitching rehab sessions in the minors and is ready to go full strength in 2012.